And, while the Nvidia GeForce GTX 1660 Ti doesn’t have the RT and Tensor cores that power Nvidia’s new RTX and Deep Learning Super Sampling (DLSS) features, it’s such a great performing card, and affordable to boot. It’s easy to see why it’s our pick for the best budget graphics card available today – though the GTX 1660 gives it some tough competition. With this new focus on value, it’s easy to see why Nvidia Turing sales are doing so well. However, unlike Nvidia launches in the past, Team Green didn’t release its own Founders Edition of the GTX 1660 Ti. Without this base model to set the stage for what we could expect from third-party cards, you’ll find a wide variety of cards going for varying prices. The good news is that we went ahead and gathered up the best Nvidia GeForce GTX 1660 Ti models you can buy today. The PNY GeForce GTX 1660 Ti XLR8 Gaming OC may look like a small graphics card, but it packs a punch. Equipped with a 70MHz factory overclock and otherwise solid specs, this card delivers on the dream of 1440p Ultra quality gameplay at 60 fps. Better yet, all of this performance costs less than 300 smackers. 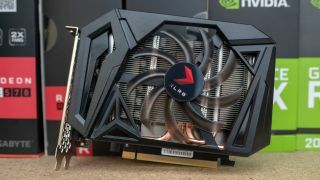 This is the best bang-for-your-buck graphics cards you can get. Looking to max out the performance of the GeForce GTX 1660 Ti? Well, then the Asus ROG Strix GTX 1660 Ti OC is the right card for you. It features the highest factory overclock we’ve seen on this mid-range graphics card yet. Additionally, its oversized heatsink and triple axial fans keep this card running a full 10C cooler than most. Overclocking this card is a breeze, thanks to its extreme cooling system. Looking for something in the middle of the road between basic and extreme? The Gigabyte GeForce GTX 1660 Ti Windforce OC is the closest thing to your average GeForce GTX 1660 Ti. Although it’s only equipped with a pedestrian dual-fan cooler, Gigabyte has made use of 3D molded curves on the fan blades for increased airflow. The graphics card’s fans also spin in alternate directions to further increase airflow. Top that off with a 1,845MHz boost clock, and this card delivers more performance for not much more money. The Palit GeForce GTX 1660 Ti StormX OC is one of the most compact graphics cards designed to fit in the smallest of PC cases. Despite its small size, this GPU still packs all the might of a full-sized GTX 1660 Ti and then some with a factory set 1,815MHz boost clock. Best of all, it costs the same amount as the most inexpensive versions of the GeForce GTX 1660 Ti, so it’ll be light on your wallet too. Just because you’re gaming with a mid-range card doesn’t mean you can’t be stylish. The MSI GeForce GTX 1660 TI Gaming X 6G is easily the most handsome of the bunch with a sharp aesthetic and fully addressable RGB lighting – in other words, you can customize how it glows in sync with an MSI motherboard. Looks aside, this card delivers tuned up performance and a Twin Frozr cooler designed to keep it chilled.